Smarter, not sweeter. That’s the philosophy behind new YQ by Yoplait, in the General Mills’ stable and once the US’s biggest yogurt player, in a bid to boost its fortunes in the wake of several years of sales decline thanks to the ballistic rise of Greek yogurt. 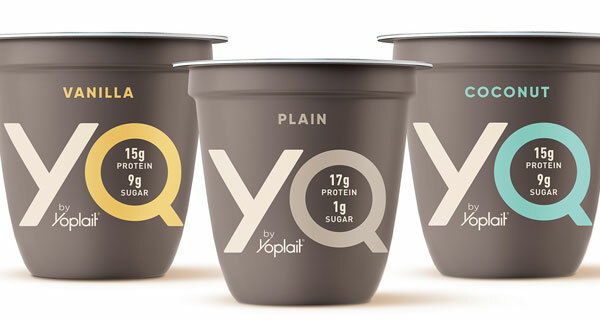 Just hitting store shelves across the US this month, YQ by Yoplait is “setting out to give people something quite different from their typical yogurt experience”. What sets YQ apart from other yogurts on the market today? One of the key differences is how it’s made. YQ starts with ultra-filtered milk, which is milk that has been passed through a series of fine filters to remove 99 percent of the milk’s lactose, the naturally occurring sugar found in milk that adds virtually no sweetness. The ultra-filtered milk is combined with active cultures that then go through special stirring technique, perfected by Yoplait in France. The result is a thick, smooth, extra creamy texture with a differential nutritional profile that is intentionally less sweet. By removing 99 percent of the lactose, YQ by Yoplait delivers 17 grams of protein and only 1 gram of sugar per serving in the Plain variety. The flavoured varieties add just enough cane sugar and fruit to this base to deliver 9 grams of sugar and 15 grams of protein. Traditional Greek yogurt starts with traditional milk and is then strained to remove water to concentrate the protein, which gets to the thicker consistency. And because YQ removes 99 percent of the lactose and is then lightly sweetened with just the right amount of cane sugar, the flavoured varieties achieve 40 percent less sugar than the leading Greek yogurt. General Mills is betting that less sugar will help spark growth in the company’s slumping yogurt unit, comments Bloomberg, as US consumers have embraced Greek-style yogurt in the past decade or so. But as Greek sales slow, the search is on for the next trend that will drive growth in the yogurt case. A year ago, General Mills released Oui, a yogurt with French heritage, and the product is on track to reach $100-million in annual sales, making it one top-performing new product launches in the past few years, according to the company. Even so, that hasn’t been enough to turn the tide for General Mills’ yogurt unit, which saw US sales slide 8 percent in the most recent quarter. While that was the third consecutive quarter of improving performance for the unit, the Minneapolis-based food giant is hoping YQ can help stabilise and turn the division around. US consumers essentially didn’t eat Greek yogurt before Chobani burst onto the scene in 2007, rocketing to $1-billion in sales in its first five years. Much of that success came at the expense of General Mills. For years, Yoplait was the top-selling brand in the US, and as recently as 2012, it accounted for about 24 percent of the US market. In 2016 Chobani took over the top spot in the US, and Yoplait’s market share has dropped to about 14 percent, according to Euromonitor. 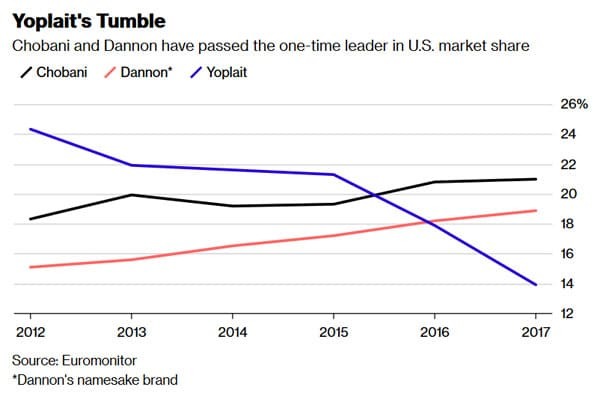 Dannon is the top seller of yogurt in the US with 37 percent of the market when accounting for all the company’s brands, including Oikos and Activia. The hemorrhaging sales prompted General Mills to review its yogurt business about two years ago. And while Oui – sold in small glass jars – has helped, the company is facing an uphill battle as the overall yogurt market wanes. US yogurt sales have dropped in each of the past two years, and Euromonitor estimates they will decline 2.6 percent this year. Yogurt with less sugar is nothing new. Light varieties have been around for decades, but those products are typically sweetened artificially. YQ uses cane sugar, and ultra-filtered milk has less lactose. The plain variety has 1 gram of sugar per serving, with 9 grams in the flavored versions. Yoplait’s original fruit yogurts can contain about twice that amount.